We have been dry cleaning for nearly forty years and we have dry cleaned nearly every type of clothing and fabric that has come our way. The equipment has modernised and processes have gotten better, faster and environmentally friendly. Our dry cleaning service is very gentle on fabrics and very tough on stains. We aim to provide the best service to our customers. We can dry clean almost any material, clothing or garment you bring into us and we provide a same day service for your convenience. Our dry clean services have always been used for cleaning of suits, dresses, shirts and tuxedo’s for business and formal occasions. Everyone values time more than ever now, we find more and more people prefer to use our dry clean services for their daily garments. Shirts, T-Shirts, Top’s and Jeans always have that special feeling when you use our dry cleaning service. You can’t beat that crisp feeling when you put on that freshly pressed shirt or feel the comfort of that woollen jumper that has been specially cleaned. Our pricing provides great value and you’d be surprised how easy, convenient and cheap it is, to dry clean your items on a weekly basis. Our experience and the service we provide we believe is second to none. We always make sure our customers are happy with their cleaning and the service they receive. If for any reason you are not satisfied with our service we are always willing to rectify any situation and have a money back guarantee on all our services. We are confident that you will always get the best service from Gills Dry Cleaners. Our full service laundry facilities offer our customers a comprehensive selection of services. We do all the work for you. Customers have a choice of wash, wash dry and fold, wash dry and iron or any of the above services. We can even do the ironing if you prefer to do your own washing at home, or just bring in your freshly washed clothes and we can dry it! Our experienced staff are experts in laundry care and if you have any special requests we can accommodate them. If you have mixed laundry with colours or different materials that require separate washes we can take care of that too. We offer a same day service if you require or a super quick turnaround for the next day if that suits. Everyone is getting busier and our services can give you more free time. You can use our services now and again, or as more and more people are doing use us all the time. Our customers use us regularly for their daily or weekly laundry requirements. Some use Gils Dry Cleaning and Laundry Services when they just need a break or more often than not just when there are no facilities available at their homes or premises. It turns out to be quite economical and of course very fast with no waiting involved, no folding, no electricity fees or detergents and no washing piling up. It’s a great feeling to have your laundry fully serviced and handed back to you washed, folded, pressed and ironed just ready to go back into the wardrobe. We have the knowledge and capability to look after large and delicate fabrics. Sometimes domestic appliances cant accommodate oversize items. Your cherished items need special care and our large machines are more than capable of cleaning your most delicate oversized items like duvets, rugs, blankets and tablecloths. For decades we have looked after delicate garments, clothing and soft furnishings from leading shops like Avoca, Foxford Woollen Mills and Northern Feather. Our Bridal Gown service is regarded as one of the most efficient Wedding Dress and Bridal Wear cleaning and presentation services in the country. We understand that your big day doesn’t end when all the celebrations are over. We want you to enjoy your day for years to come. What better way than to have your dress professionally cleaned and presented in our state of the art archival presentation boxes. Check out our Bridal Gown Service page for all the details. Our shops at four different locations in Westport, Ballina, Castlebar and Dunshaughlin have the experienced staff to look after all our commercial customer’s needs. We have the capacity to deal with businesses that need a quick turnaround with large quantities. We work with businesses that require items serviced on smaller budgets. We cater for all your requirements and are always willing to help our customers come to the best solutions for their laundry needs. Check out our page dedicated to commercial services. Our shops in three County Mayo locations at Westport, Castlebar and Ballina and our Dunshaughlin shop in County Meath means that your dry cleaning and launderette requirements are always well catered for across the region. We are conveniently positioned at all our locations for adequate parking and access to our shops. Check out our location specific pages for contact details and directions to our shops in Westport, Castlebar, Ballina and Dunshaughlin. 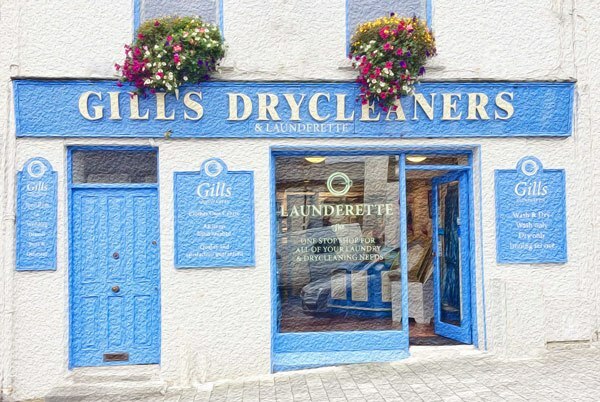 Gills Dry Cleaning and Laundry offer our customers a convenient collection and delivery facility in areas serviced by our Westport, Castlebar and Ballina shops. You can easily drop off your laundry or dry cleaning requirements or we will pick them up and leave them back to you at no extra charge. All we need is an accurate address or Eircode. We believe in offering you best service possible and we are always available to answer any queries you may have. Ask staff in any of our shops or send us an email.